The exhibition and conference space run by the Building Centre and New London Architecture organisation, just off Tottenham Court Road. 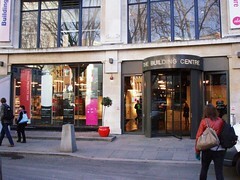 The Building Centre provides an excellent resource for those interested in London and its future development. The exhibition space is dominated by a vast 1:1500 scale model of central London, which picks out all the new and proposed building developments across the capital. There are also rotating exhibitions taking place in the adjoining space. Regular lectures and occasional conferences take place in the building, some of which are open to the public (such as their breakfast lecture series, which are given at 8:30-9:30am) -- check the website for details. There is a bookshop near the rear of the ground floor which, apart from technical and professional publications (both books and magazines), also stocks an extensive range of books about architecture and the built environment. There is also a small cafe. Last visited by Ewan, March 2008. Opening hours taken from the Building Centre website, February 2019. Last edited 2019-02-06 10:50:40 (version 11; diff). List all versions. Page last edited 2019-02-06 10:50:40 (version 11).